When employees leave – especially the good performers – this translates to a higher cost for employers to replace lost staff as well as a loss of talent, knowledge and innovative employee ideas. One of the things that you can do to retain staff is to develop a culture for innovation in the workplace to enhance employee motivation and enthusiasm that a staff suggestion system or scheme is a means to this end. What is a Staff Suggestion System? 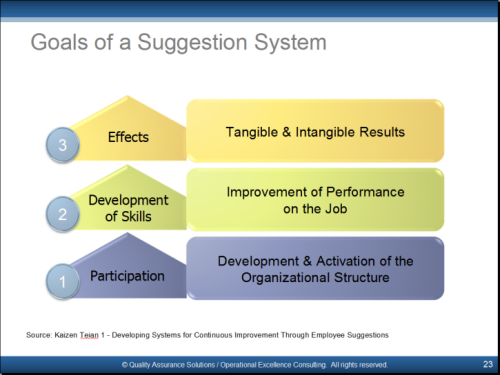 A staff suggestion system (SSS) is a formalized mechanism which encourages employees to contribute constructive ideas for improving the organization in which they work. The overall aim is to gather, analyze and implement employee ideas in order to create results that have a positive impact on the business and/or deliver new value to customers. enhances communication between employees and management. For an employee suggestion system to be effective, management needs to create a culture that encourages employees to think and find better ways to do things, including improvements to product and service offerings. There has to be a culture shift from a ‘complaining workforce’ to a ‘thinking workforce’. To achieve a high implementation rate, suggestions have to be job-oriented and implemented in the creator's own department or function. 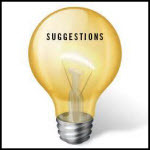 Form a suggestion committee - Get together a small group of people from different functions. Integrate the suggestion system into existing in-company productivity initiatives, e.g. Quality Circles. Involve people - Create interest by involving as many people as possible from the start. Invite employees to suggest names and design logos/mascots for the suggestion system. Promoters and in-company publicity - Announce the suggestion system to all employees. Highlight names of those who have contributed to the planning and setting up of the system. Announce the suggestion system in the company newsletter and intranet and put up posters to generate publicity. Hold a convention or conference and invite the CEO make the opening address. Take advantage of the occasion by distributing suggestion forms and invite employees to submit at least one suggestion per month. 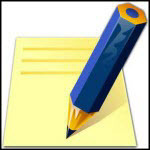 Consider developing monthly themes (e.g. customer service) to focus ideas on an important issue that the company wants to improve. Create the atmosphere by using more than a single method to promote employee ideas. For example, encourage new hires undergoing on-the-job training to think of better ways of doing things. Make reference materials such as related books and videos available. Disseminate monthly performance metrics on the SSS so that employees are aware of their department’s performance. Create categories of awards. For instance, awards for increasing revenue, awards for reducing costs, etc. Launch an Innovation or Employee Ideas Day. Announce the results achieved and present awards to individuals, groups and departments for contributing their suggestions. You can also share success stories and invite external speakers to give talks on related topics. As in implementing any continuous improvement initiative, there are challenges in managing and sustaining a suggestion system. Employees could fear reprimand for making suggestions as their supervisors might perceive their ideas as indications that the department is “not perfect”. Where ideas are routed to the employees’ supervisors for vetting, there could be a counter-productive filtering of ideas at department level. Sometimes there could be periods of low participation rates. Possible causes include failure to maintain constant publicity, no target setting, heavy workloads and disillusionment from seeing good ideas that were not implemented. An effective SSS requires management commitment to keep it alive. It is important to involve the middle management in the ideas generation process as they are a key pillar to sustain the mechanism. 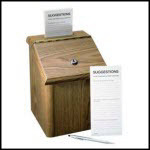 Recognize and reward individuals and groups for participation. To demonstrate credibility to the workforce, management needs to act on the good suggestions and evaluate suggestions fairly and promptly. As Winston Churchill said, “The only way to have a good idea is to have lots of ideas.” For this to happen, organizations need to implement a mechanism to capture employee ideas and bubble up the good ones. A healthy suggestion system can bring many tangible and intangible benefits to the organization as well as retaining valuable talents in the company.